If puts focus on ways of working together, and that we need to find better ways of working that make better use our individual and collective time and capacity. To do this we need to reflect more on why and how we use certains tool (a fool with a tool is still a fool). It not only stresses that new technologies are core enablers, but also new concepts such as crowdsourcing, collective intelligence, social networking, and cloud computing. ‘Across the extended enterprise’ means that the scope is not limited to teams or organizations. A collaborative effort can potentially involve any stakeholder – even customers and consumers – as well as any number of stakeholders. Let’s put this in contrast to the more traditional view of technology-enabled collaboration ( virtual collaboration). Traditional collaboration technologies (a.k.a. groupware) and ways of working focused on team collaboration, e.g. people working together on a common task or goal. The choice of this focus wasn’t as much due to what was possible from a technological point of view, as it was due to the fact that the need for enterprise-wide collaboration wasn’t apparent and imminent at the time when these technologies were introduced. Business process management addressed the needs for cross-enterprise coordination and communication that existed at that time. R&D, Production, Sales, Marketing and other business functions focused on optimizing the performance of their own activities and the business strategies that were crafted by top management didn’t just set the overall plan but pretty much detailed what each business function should be doing. In a highly dynamic, fast-paced and inter-connected business environment, this way of running a business is no longer possible. Tomorrow's organizations will have to be more as a flock of birds, or shoal of anchovies, than can take new shapes when required. Instead of relying on long-term planning, we have to be prepared for the unexpected. Coordination must happen sideways, in all directions, all the time. Decisions must be made wherever and whenever they need to be made, by people who understand the environment where it is to be executed, while at the same time keeping the shared purpose and big picture in mind. This cannot be done if we continue to work with our own tasks in business function silos and blindly follow detailed strategies crafted by top management, dictating the execution without adjusting it to the (changing) environments where the execution is to take place. 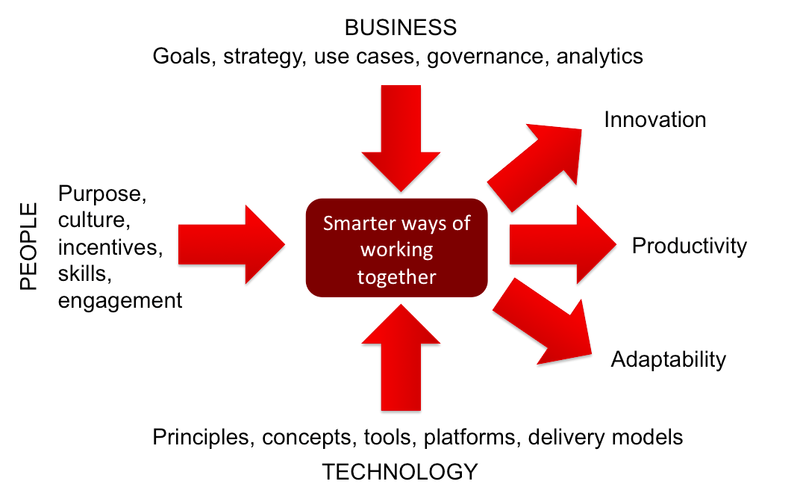 I see Enterprise Collaboration as an umbrella term for more or less all concepts and technologies that enable smarter ways of working together. One of the concepts that fit under this umbrella is Social Collaboration. It is a concept that has been adopted by many software vendors in the collaboration technology space lately, IBM, Oracle, OpenText, and NewsGator to mention a few. Social Collaboration is different from traditional collaboration in the sense that it stretches and scales far beyond teams. It connects people throughout the extended enterprise to allow them to collaborate on any purpose, big or small. It allows for instant and immediate many-to-many interaction, conversations, sharing and co-creation involving anyone from anywhere within the enterprise. As social collaboration builds upon principles such as openness, participation, and recognition, it helps create the workplace awareness that is required to make decisions locally and still seeing the bigger picture. The driving force behind social collaboration is the need to remove structural holes in the communication between people, and it does so by helping people to discover each other, connect and build relationships far beyond their teams and business functions. By being able t build new ties and and strengthens the weak ties between groups, the likelihood of group thinking and the sub-optimization that happens when groups optimize for their own goals without seeing the bigger picture decreases. In other words, the negative effects of team collaboration are balanced up. The picture above can be seen as a simple, high-level framework for Enterprise Collaboration efforts. People are the engine of any enterprise, and such things as purpose, culture (values, attitudes, behaviors), incentives, skills, and engagement determine how well the engine runs. Business sets the direction, defines what needs to get done, by whom, when and why, and evaluates how we are performing. Technology is the core enabler, providing us with an environment and tools to achieve things together without being delimited by geographies and other barriers to communication and coordination.